The rough economic waters have been tough on many performing arts organizations here in L.A., and each one has been forced to respond in its own way. Center Theater Group is no exception to this rule, and L.A.’s biggest theater organization has gone from the ambitious production of Kingsley‘s Dead End complete with a flooded orchestra pit that announced the arrival of artistic director Michael Ritchie in 2005 to a remarkably lean 2010 season. CTG is still in business, which is good news in and of itself, but the writing is on the wall with shows that have small casts, big name movie stars, and/or recognizable touring musical properties especially at the Ahmanson and Mark Taper Forum at the music center downtown. It is a testament to the company that despite the inevitable adjustments of ambition, the productions themselves have continued to be surprisingly good in quality overall including a wonderful recent run of Next to Normal at the Ahmanson and Judith Ivey’s spectacular turn in William’s The Glass Menagerie just last Fall. This year, the Mark Taper Forum will host only four productions with an additional offering included for the venue’s subscribers: Moisés Kaufman’s 33 Variations at the Ahmanson that will kick off later this month with Jane Fonda. Before that, however, the first of this year’s Taper shows, Stories by Heart is now on stage this month. 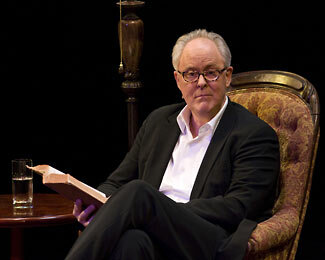 The show meets two of the three necessary criteria in the current environment, it has a big movie star in its author and performer, John Lithgow, and it has a small cast in that it’s a one-man show. It’s a somewhat slight, but enjoyable production, which consists of dramatic readings of two short stories, P.G. Wodehouse’s “Uncle Fred Flits By” and the more obscure Ring Lardner’s “Haircut”. Lithgow, of course, is a remarkable actor and he delivers the stories with expert skill as promised in the title, by heart. But this literary-inspired endeavor is no Gatz. Each story is wrapped in a small amount of personal, sentimental context from Lithgow, who explains the personal significance of the story-telling project and the development of Stories by Heart. If anything, the show is more of a testament to the skills of Wodehouse and Lardner than anything else and both works do lend themselves well to this dramatic treatment. But Stories by Heart even at over two hours is still an insubstantial wisp of a show. Lithgow makes a play to underpin his readings with some requisite big questions he asks the audience directly regarding why we, as humans, like to tell and hear tales. He posits that all theater is about storytelling early on and that actors are, by definition, storytellers. I’m not so sure about that contention; though, I’d agree most of the time it is true. I think there are plenty of other reasons people go to the theater besides stories such as visual spectacle, and emotional response, both of which can happen in the most non-narrative of theatrical events. In fact, if there is anything unusual about Stories by Heart, it is how old-fashioned it is. Narrative is far less crucial to the stage now than it has been at perhaps anytime and the tightly-plotted stories of Lithgow’s monologues seem out-of-place and overly neat despite their many fine qualities. The show is not unpleasant, though, and continues at the Mark Taper Forum through Feb 13. A word of advice, though. Although the text for both of these stories is readily available on line, go unprepared, its better to experience them told live.